159 sq. m., 3 bath, 3 bdrm 2 story. SOLD €269,000 EUR. Title Deed & Private Pool. The ground floor of the property features a spacious L-shaped living room with comfortable lounge, dining area and corner kitchen. The kitchen is nicely separated from the living area by a breakfast bar with top quality granite surface. This is a wonderful home that has been taken care off and ready to be enjoyed by the new owners. If you are looking for a villa for sale in Peyia then look no further because this home is guaranteed to have many of your needs. A MUST SEE!! 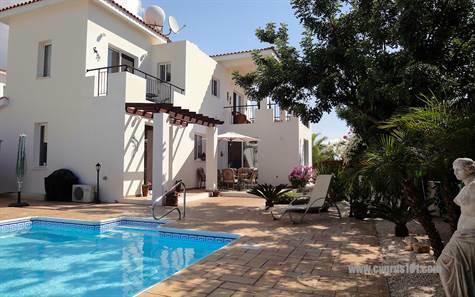 Click here to view all of our properties for sale in Peyia, Paphos, Cyprus.